Yesterday, right after Angela Merkel’s plane left the runway at the Budapest Airport, I jotted down my first impressions. It was a busy day for the German chancellor, so I had to be very selective in my post. I concentrated on Merkel’s comments, largely because they were the most unexpected elements in the exchange. Moreover, I talked mostly about her reactions to Hungarian domestic issues and spent a great deal less time on the disagreements between the two leaders over foreign affairs. Let’s start with their attitudes toward Putin’s Russia. According to Orbán, Ukraine is important for Hungary because it is a neighbor of Hungary, because there is a Hungarian minority across the border, and because the gas that Hungary needs badly travels through this country. Therefore, he said, Hungary “can stand only on the side of peace. We can imagine only a solution that will take us toward peace.” But let’s see what Merkel had to say. According to her, the Germans would also like to have a ceasefire and political stability in Ukraine that “can guarantee the territorial integrity of the country.” Something Orbán didn’t talk about. Merkel also gently reminded Orbán that Hungary is not the only country that is dependent on Russian gas, indicating that it is unacceptable for Hungary to have a different viewpoint on the question of Russian sanctions. Csaba Molnár, the number two man in the Demokratikus Koalíció, thought that Orbán was cowed and “behaved like a scared little boy standing by his teacher’s side.” I disagree. I saw exactly the opposite: a combative Viktor Orbán who will not be swayed by any argument and who will continue to build his illiberal state. I’m afraid the same might be true when it comes to negotiations with Vladimir Putin. Even though he might sign on to further sanctions, he will try to make a deal with Putin regardless of EU disapproval. It is another matter whether Putin will swallow a big one and give preferential treatment to Orbán despite the meager returns he can expect from Budapest. As even the right-wing media had to admit, the visit was not a great success, although it was designed to be a showcase of German-Hungarian friendship and a stamp of approval by the German chancellor of the Orbán regime. What does Fidesz do in such an awkward situation? After all, they cannot admit that Merkel and Orbán disagreed on almost everything, starting with Russia and ending with the nature of democracy. The simplest and the usual Fidesz response in such cases is to resort to outright lying. This is exactly what happened today. Vs.hu is a relatively new internet news site that came out with the startling news that the real significance of the conversation was in the realm of new German investments in the Hungarian economy. András Kósa, a well-respected journalist who used to be on the staff of HVG, just joined Vs.hu. He was told by unnamed members of the government and local German businessmen that although on the surface there was visible friction between Merkel and Orbán, in fact “concrete important industrial agreements came into being on Monday.” Siemens will be involved in the construction of the Paks Nuclear Power Plant. In addition, Hungary will buy thirty helicopters from Airbus, not from the American Sikorsky or the Italian-British AgustaWestland. Kósa was told that “BMW is contemplating opening a factory in Hungary.” Only the exact location remains to be settled. And, on top of everything else, Mercedes will build a new factory to manufacture a new model. Well, that was quite a scoop. The Hungarian media went crazy. Dozens and dozens of articles appeared within minutes, and every time the story was retold it became grander and grander. 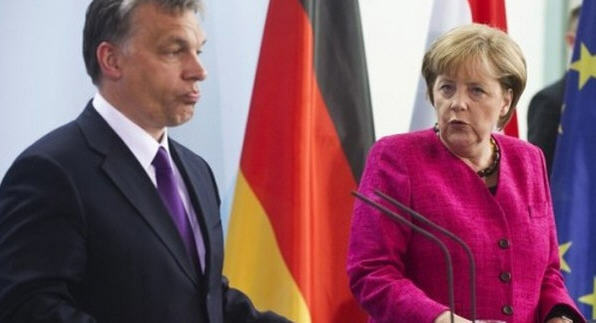 While the original article emphasized that all these favorable developments “might happen,” by the time the story got to Magyar Nemzet it became “Gigantic German investments are forthcoming as a result of the Merkel-Orbán meeting.” Válasz discovered that the real significance of the meeting was that new “gigantic German investments are coming to Hungary,” obviously all that taken care of during a short luncheon. Even such a reputable site as Portfolio.hu fell for the story. The first word of warning came from a specialized internet site that deals with the car industry, Autopro.hu. 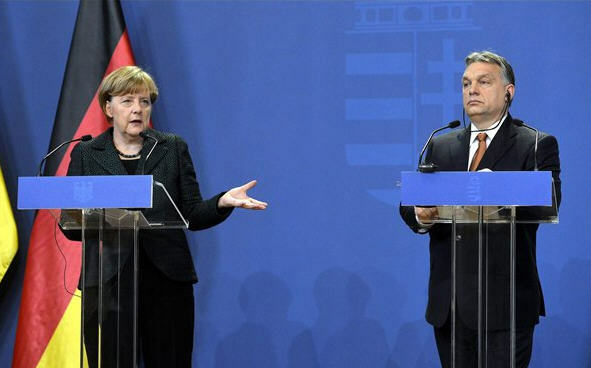 It is possible that economic relations were discussed, but it is impossible that there could be negotiations between Merkel and Orbán regarding concrete projects, the author of the article remarked. This is not the first time that the possibility of a BMW factory is being heralded by the Hungarian media, but nothing ever came of it. Moreover, if there are such plans or decisions, they would not be discussed by Merkel and Orbán but by the top management of BMW and Hungarian economic experts. Autopro.hu didn’t manage to get in touch with BMW, but they were told by Mercedes that at the moment they have no intention of building another factory. Later the pro-government Napi Gazdaság learned from BMW headquarters that “the BMW Group has no plans to build a factory in Hungary.” I don’t know whether the rest of the story, about Siemens and Airbus, is true or is also a figment of the imagination of certain government officials. I consider Kósa a reliable and serious journalist who would not make up such a story. But why would government sources leak information about nonexistent projects? What do these so-called high government officials think when they concoct stories that are bound to be discovered to be false? Perhaps they think that the false news will spread like wildfire, as it did in this case, and that the correction will be reported by only very few media outlets. Therefore, it can be considered a successful communication stunt. Fidesz is good at that. Others seem to be convinced that Merkel is going to Budapest to ensure that Viktor Orbán will vote together with the rest of the European prime ministers to extend the sanctions currently in force against Russia. After all, it wasn’t so long ago that the German chancellor made it clear that sanctions can be lifted only after the agreement reached in Minsk is fulfilled. And nothing of the sort has happened. In fact, just this morning Kiev announced that 700 Russian troops had crossed into Ukraine to aid the rebels fighting for control of the eastern provinces. Attila Ara-Kovács, the foreign policy expert of Demokratikus Koalíció, is one of those who believe that the trip’s main purpose is to convince Viktor Orbán of the necessity of extending the sanctions. But he goes even further when he hypothesizes that Merkel has another message for Orbán in light of the recent demonstrations: he should end the political conflict at home. Somewhat similarly, Stratfor, an American geopolitical intelligence and advisory firm, is convinced that Merkel’s visit is part and parcel of a U.S. “diplomatic offensive” in the region and can be viewed as putting joint U.S.-German pressure on Viktor Orbán. The aim is to stop the spread of Russian influence in the region. The other narrative of the impending Merkel visit comes straight from Fidesz. It is well summarized in the headline of an article by Zsolt Hazafi: “Is Merkel Orbán’s guardian angel?” It is true that the journalist turned the Fidesz message into a question, but the answer is “yes.” The story line goes as follows: Hungary and Germany are very close allies who synchronize all their diplomatic moves. 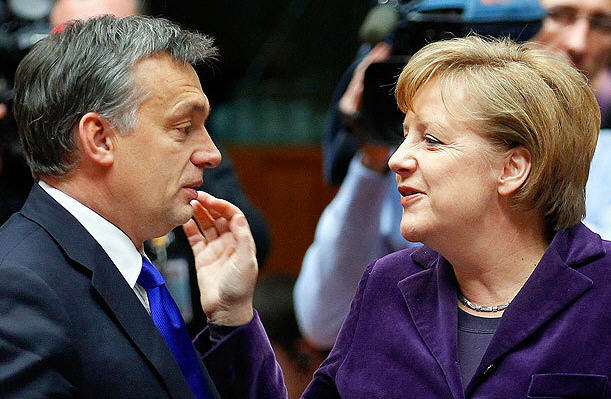 More than that, Orbán’s Hungary is doing Germany’s bidding. Or at least this is what József Szájer, a Fidesz member of the European Parliament, intimated in his interview with Antónia Mészáros of ATV yesterday. As he put it: “Germany sent us ahead” to test the ground vis-à-vis Russia. Berlin, according to him, is just as much against sanctions as Budapest is, but Merkel is constrained, presumably by the United States. Therefore, she secretly welcomes Hungary’s position on the sanctions. After talking with several high-level government officials, Hazafi gained the impression that in the last few years a Russian-German-Hungarian triangle came into being, a three-way relationship that includes an understanding about building a second reactor at the Paks nuclear power plant. Why would the German chancellor agree to the secret Russian-Hungarian deal on Paks? According to this narrative, Germany, where soon enough there will be no nuclear power plants, will be able to get inexpensive energy from Paks. Fidesz informants pointed out that a German firm was instrumental in making the Russian loan to Hungary possible. They added as proof of the understanding between Germany and Hungary on Paks that Günther Oettinger, former European commissioner for energy matters and a German, raised no objection to the Putin-Orbán deal. Members of the Hungarian government and leading Fidesz leaders consider both visits–Merkel’s and Putin’s–diplomatic triumphs. “Hungary is back on the map,” Orbán allegedly said. Népszabadság also had its own Fidesz informants. They claim that Germany didn’t object to the Orbán-Putin meeting since Germany and Hungary work hand in hand when it comes to Russia. Some of the more embarrassing statements of Viktor Orbán are no more than trial balloons. One example is the question of sanctions. According to other Fidesz politicians, those who see a connection between the visits of Merkel and Putin “are not far from the truth.” Insiders also claim that the relationship between Merkel and Orbán is close. According to them, the two became closer after their hour-long meeting in Milan last year. Government officials, when claiming close German-Russian-Hungarian cooperation, usually bring up the fact that Klaus Mangold, former CEO of Daimler-Chrysler, was the middleman between Orbán and Putin throughout the negotiations. The informers seem to be pretty certain that “it is no longer in the interest of Germany to talk seriously about the lack of democracy in Hungary.” The author of the article (we don’t know who he/she is because there was no by-line) added that Merkel might have to resort to more serious criticism after “the prime minister’s crude anti-immigration theses” in the wake of the terrorist attacks in Paris. So, here we have two irreconcilable narratives. I find the Fidesz version of close German-Hungarian relations hard to believe. There are just too many signs that contradict it. Unless, of course, we assume duplicity on the part of Angela Merkel. After all, time and again she expressed her misgivings about Russian aggression and her support of the sanctions, including additional ones if Russia refused to cooperate. Such a double game would make no sense, especially now that Russia is in serious economic and political trouble. Thus, my hunch is that the sudden talkativeness of Fidesz potentates is a concerted effort on the part of the Orbán regime to burnish the prime minister’s image, to point to his diplomatic importance and genius, and to portray him as one of the most important leaders in Europe. I am inclined to believe that the main reason for the Merkel visit is indeed the question of the sanctions and Hungary’s overly chummy relations with Putin. I am also convinced that Merkel will talk about what Hungarians call “the democracy deficit,” which is something that is hard to ignore given the wide coverage of Orbán’s illiberal state and the latest demonstrations. In brief, I consider this latest tsunami of leaks by Fidesz politicians to be a part of a disinformation campaign. Posted in Hungarian politics and tagged Angela Merkel, Attila Ara-Kovács, Budapest, Fidesz, German chancellor, German-Hungarian relations, German-Hungarian-Russian triangle, Germany, Hungary, József Szájer, Paks Nuclear Power Plant, Russia, Russian-Hungarian relations, Stratfor, Ukraine, Viktor Orbán, Vladimir Putin on January 19, 2015 by Eva S. Balogh. Népszava, a social democratic paper, is generally well-informed about the “secrets” of the government. This time it surprised its readers with a front-page article announcing a planned visit by Vladimir Putin to Budapest sometime in March. Budapest, judiciously spurned by western political leaders of late, is becoming a hub of diplomatic activity. Angela Merkel is scheduled for a five-hour visit on February 2 and now the news about Putin. 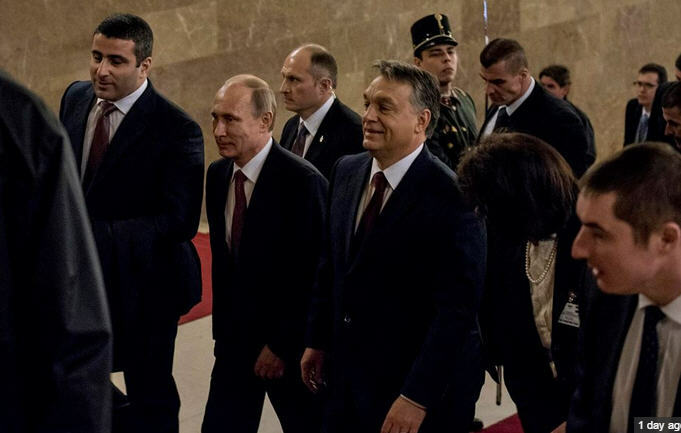 The newspaper pointed out that this will not be Putin’s first visit to Budapest. He was the guest of Ferenc Gyurcsány in February 2006 when the Hungarian prime minister supported the idea of the Southern Stream to the great annoyance and disapproval of both the United States and Viktor Orbán. Orbán at that time considered such a policy to be the equivalent of treason. The paper also called attention to Viktor Orbán’s about-face when he paid a visit to Moscow in November 2010 and again in February 2013. Actually Népszava missed an earlier indication that a change in Russo-Hungarian relations was in the works. In November 2009, prior to his becoming prime minister, during a visit to St. Petersburg as one of the vice presidents of the European People’s Party Orbán attended the eleventh congress of the ruling United Russia Party. During this visit he indicated to Putin that he wanted “to put Russian-Hungarian relations on an entirely new footing.” He had made up his mind to conduct a pro-Russian foreign policy once in power. Perhaps the first person to comment on the news of the visit was László Kovács, former foreign minister, who happened to be a visitor on the early morning program “ATV Start.” He assumes that the initiative for the visit came from Moscow. Zoltán Sz. Bíró, a Russian expert, shares Kovács’s hypothesis. Putin must have been the one to suggest the visit in the hope of convincing Orbán to veto the extension of EU sanctions against Russia, which expire in March. In Biró’s opinion, a veto by Orbán not supported by any other EU country would poison the relationship between Hungary and the West for a very long time. Therefore he doubts that Orbán would dare to go that far. Attila Ara-Kovács, head of the “foreign cabinet” of the Demokratikus Koalíció, told Klubrádió that he knew about the impending visit for about a week but, according to his information, Putin’s visit will take place not in March, as Népszava reported, but on February 9. 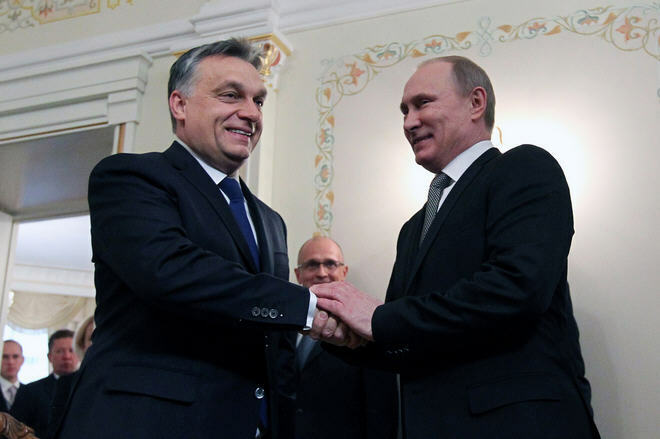 In his reading, it was Orbán who invited Putin and not the other way around, perhaps to show the world that he is not alone in his battle with the United States and the European Union. If Orbán sensed that Angela Merkel intended to deliver “bad news” during her stay in Budapest, perhaps a looming visit from Putin might temper her disapproval. Ara-Kovács considers this latest move of Orbán a provocation that will only add fuel to the fire in the strained relationship between Hungary and the West. What are the reactions of the opposition parties? 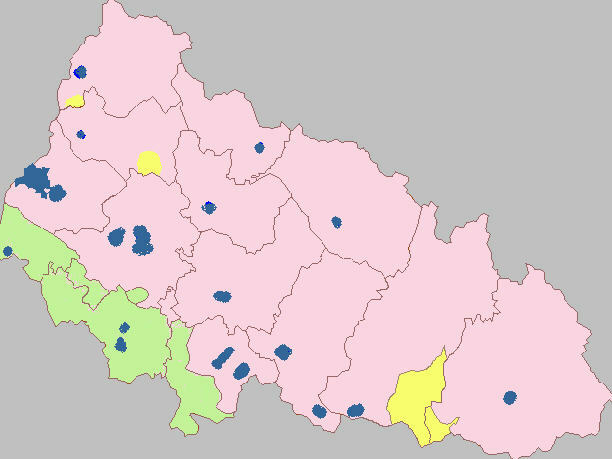 As usual, MSZP is hibernating. Not a word from József Tóbiás, the party chairman, or from anyone else. Együtt somewhat naively demands that the government consult with all parliamentary parties “in preparing the meeting between Prime Minister Viktor Orbán and the Russian president.” Együtt can wait for such a consultation. Együtt joined LMP in its opposition to the construction of the Paks2 nuclear power plant. Both parties want the government, during the prime minister’s meeting with Putin, to break its contract for a 10-billion-euro Russian loan to have Rossatom build the plant. Well, that will not happen either but it is possible, as Zoltán Sz. Biró suspects, that Russia for financial reasons will give up the idea of the project. PM’s reaction was the most sensible: the party would like to see a huge demonstration against Putin’s visit organized by all the democratic opposition parties as well as by the civic groups that were responsible for the recent mass demonstrations. It is hard to know what the next couple of months will bring on the international scene. We have no idea what kind of message Angela Merkel will deliver to Budapest on February 2. We don’t know what foreign reactions to Putin’s visit will be. But domestically the Russian president’s visit might just be a potent catalyst for political change. Today let’s look at some Russian responses to Viktor Orbán’s policies as well as Russian analyses of U.S.-Hungarian and U.S.-EU relations. It was about a month ago that Vladimir Putin profusely praised Orbán’s Hungary as Russia’s best friend and ally in Europe. A few days ago Hungary again came up on a Russian State Television program called “Bремя покажет” (Time will tell) when a political scientist, Yuri Solozobov, an associate of the National Strategy Institute of the Russian Federation, explained to his audience that, instead of employing sanctions against the European Union, Russia should use some of its member countries to loosen the unity of the Union. After all, Russia already has allies in Eastern Europe: Hungary and Serbia. If there is no consensus regarding sanctions against Russia, the entire anti-Russian policy of the West will collapse. The video below is a three-minute segment on Hungary with English subtitles. Solozobov is not the only Russian political scientist who contemplates using Hungary as a tool in Russian diplomacy. Pravda interviewed two other political analysts in the aftermath of Viktor Orbán’s announcement that “a new era has started when the United States not only interferes but takes an active part in internal politics in central European countries,” adding that this was “due to the Russia-Ukraine conflict, and the free trade talks under way between the European Union and the U.S.” Finalizing the free trade agreement, officially called the Transatlantic Trade and Investment Partnership (TTIP), has been dragging on for a very long time and the issues are too complex to discuss here, but promoters claim that it would promote economic growth. Opponents in Europe insist that it would benefit only American corporations and would cause harm to the environment by adopting less stringent measures than those currently in force in Europe. Just the other day farmers and trade unions demonstrated in Brussels against the treaty. The other analyst who was questioned on Hungary was Aleksey Drynochkin, lead research scientist at the Institute of Europe of the Russian Academy of Sciences. He stressed that American political pressure on Hungary has been relentless. First, there were the accusations of a lack of democracy, now it is “corruption.” Surely, this is a cover story just as Viktor Orbán said. Drynochkin agrees with Orbán: the demonstrations are also the work of the United States. And he foresees the possibility that “some technical regulations on [the] operation of nuclear stations within the European Union may be toughened,” presumably undermining the enlargement of the Paks nuclear power plant by the Russian firm Rossatom. As for the free trade agreement, according to Drynochkin “in terms of a bare economic theory, this project is likely to have no problems.” But there is a political aspect to it, and it “is possible that [the] Americans are pursuing their own goal–to completely finish off Europe,” I guess economically. But what the U.S. would achieve by “finishing off Europe” remains a mystery. In his opinion, in political terms the European Union will be less and less independent and “will be more and more the conductor of some foreign actions and intentions.” What Drynochkin and other Russian analysts fail to see is that it was Russian aggression against Ukraine that brought the European Union and the United States closer together. Moreover, it is possible that Vladimir Putin’s belligerence will be the catalyst for a speedier adoption of the EU-U.S. free trade agreement. But Russian strategists are correct: trying to undermine the cohesion of the European Union is a great deal less costly and risky than settling for a long trade war and a series of sanctions. Trying to torpedo the free-trade agreement is also in Russia’s interest. But why does Hungary support the Russian position in these matters? What does Hungary gain from standing by Russia? I find the Hungarian government’s position hard to explain. And why does the editorial board of Magyar Nemzet believe it necessary to turn up the volume, accusing the United States of creating a Hungarian Maidan in Budapest? The title itself is outrageous: “Kievan scenario with Western producer?” Or why does Zsolt Bayer, a friend of Viktor Orbán and the owner of the #5 Fidesz membership card, write about “the many American scoundrels (gazember)” who are responsible for the Maidan uprising? He says that the Americans achieved what they wanted. They will privatize the gas pipelines and will take over the rich land of the country. In brief, they will exploit Ukraine. Hungary has a bad track record when it comes to picking sides in conflicts. And such governmental decisions have always come at a high cost to the country. “This time is different,” governments say, but it’s almost never different. Vladimir Putin’s announcement yesterday about the cancellation of the Southern Stream caught the Hungarian government by surprise. It looks as if Putin neglected to tell his loyal strategic ally that Russia was planning to scrap the project upon which the Orbán government built its foreign and energy policy. It must have been a bitter pill to swallow, and I am fairly certain that it will not be the last. Because Russia is in trouble. Big trouble. The current economic situation reminds Csaba Káncz of privátbankár.hu of the late Soviet period when in 1985 Saudi Arabia dramatically raised the daily quota from three to eight million barrels and the price of oil dropped from thirty dollars to ten. The same commentator reminded his readers that three-quarters of Russian exports come from oil and that half of the Russian budget depends on oil revenues. The Russian situation today raises the specter of 1998, when the country defaulted on its domestic debt and declared a moratorium on payment to foreign creditors. Indeed, Russian economic prospects are grim. Since the beginning of the year the ruble has lost 60% of its value. Inflation is at 9%. Official figures for economic growth are revised practically monthly, and it looks as if Russia is heading toward recession. Apparently Rosneft, the giant Russian oil company, had to sell 20% of its shares to keep the 2015 budget in balance, at least for a while. The Russian people are already feeling the pinch. Real wages may drop by 4%. Otherwise, the Hungarian media uniformly interprets the cancellation of the Southern Stream as an indication that Viktor Orbán’s Eastern Opening has failed. Hungary’s foreign policy, if you can call it that, is in tatters. How could it happen that the Hungarian administration put its blind faith in Putin’s Russia when for months it has been quite obvious that the Russian economy is in trouble? In fact, it was in trouble even before the western sanctions were imposed. Not only foreign analysts found the Russian situation worrisome but Zoltán S. Biró, a Hungarian expert on Russian history and politics, talked about the possibility that the Southern Stream might not materialize. A former Hungarian ambassador to Moscow, who is also knowledgeable about Russian affairs, also warned that the project might be scrapped and even ventured to predict that Paks might turn out to be a pipe dream. But these are not the people Viktor Orbán listens to. Already under Foreign Minister János Martonyi (2010-2014) a large number of old hands in the foreign ministry were fired because they were deemed to be too closely associated with the socialist-liberal governments. But prior to the move of Tibor Navracsics and Péter Szijjártó to the ministry there were still a few people left who could have given an honest appraisal of the Russian situation. I hear, however, that fear has spread throughout the administration and that the foreign ministry is no exception. People are afraid to give their honest assessment of a situation because they know that “bad news” is not welcome in the prime minister’s office. Moreover, it has been apparent from day one that Viktor Orbán is conducting his foreign policy through Péter Szijjártó, a diplomatic greenhorn. And the “experts” they listen to are the folks at Századvég whose ideas about the world are staggeringly deficient. This is, at least in part, how Viktor Orbán ended up in this mess. On Klubrádió Ferenc Gyurcsány also talked about the failure of a foreign policy that relies on an ever-weakening Russia. The Eastern Opening has no future and Orbán should end “the age of adventures,” a reference to the tenth-century Hungarian military incursions into Western Europe that eventually came to a sorry end when Otto I, the Holy Roman Emperor, taught them a lesson near Augsburg in 955. Gyurcsány made another historical allusion when he talked about Hungary ending up being “the last servile retainer” (csatlós) of Russia, comparing today’s situation to 1945 when Hungary stuck with Hitler’s Germany to the bitter end. What did the administration have to say? Not much. According to Péter Szijjártó, “Russia has the right to make such a decision and Hungary takes note of it.” This terse statement barely hides Hungarian annoyance and disappointment. He added that “the situation is entirely new. We have to look for new sources of energy.” His statement to MTI indicated that the Orbán government hasn’t done anything to look for alternative sources of energy. 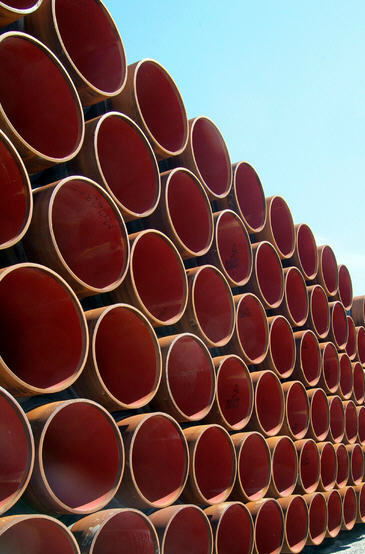 Everything was hanging on the completion of the Southern Stream by 2017. Today Szijjártó gave an interview to Magyar Nemzet in which he was asked about “the secure position of the Paks project.” His answer to the question was that, as far as he knows, Rosatom has never gone back on its commitments. A rather tricky answer because the real question is whether the Russian government is willing and able to lend ten billion euros to Hungary. If not, Rosatom is out of a job. So, this is where we stand at the moment. This new development is clearly a blow to Viktor Orbán’s grandiose plans. The question is whether he learned his lesson or whether he will actually ratchet up his eastern policy, as many commentators predict.